Postmodern Pimpernel: Did you know? 5. Saints Cyril and Methodius, venerated throughout the Slavic world as "Apostles to the Slavs" and as fathers of the Cyrillic alphabet, spent a considerable time working in the area of today's Hungary. The two Greek brothers were sent on an evangelizing mission to Great Moravia in 863. Four years later they had to visit the Pope to defend the Slavic liturgy they promoted. On the way to Rome they stopped for a year in Mosapurc, the capital of a Slavic vassal state of the East Frankish Kingdom. As the guests of Prince Kocel there, they taught fifty monks the Slavic alphabet and the Slavic liturgy. After Cyril's death, Methodius was named archbishop of Great Moravia and Pannonia in 869. His actual seat was Mosapurc before he returned to Great Moravia in 870. The location of Mosapurc was long debated among historians, but today the ruins in Zalavár, near Lake Balaton, are generally regarded as the remnants of Prince Kocel's court. Slovakia, where the commemoration day of Saints Cyril and Methodius is a national holiday, helped inaugurate a monument of the two missionaries in Zalavár in June 2013. 4. 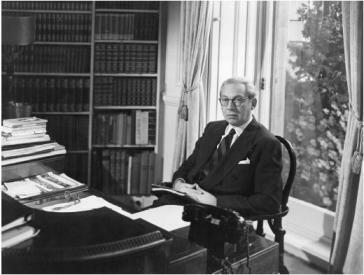 Alexander Korda, the Hungarian-born British film director fled his home country in 1919 because of the role he had played in the short-lived Hungarian Soviet Republic earlier the same year. Mr Korda had headed the "film production department" of the Hungarian Soviet government, which had supervised the nationalized film industry. Korda had directed films in Hungary since 1914. Following his emigration he worked in Vienna, Berlin, Paris, London and Hollywood. He earned international reputation by his 1934 film "The Private Life of Henry VIII". In the same year he produced another classic, "The Scarlet Pimpernel", the name giver of this blog. Mr Korda has recently lent his name to a film studio established in Etyek, close to Budapest, which houses an exhibition on him as well as on the history and tricks of film-making. Worth visiting! Színház - Magyar Televízió, 1994. 3. The Hungarian voice of old Rose in James Cameron's Titanic was the last dubbing role of Klári Tolnay, one of the greatest Hungarian actresses of the 20th century (source: ISZDB). She was 83 when she lent her voice to the 100-year-old lady narrating the story of Titanic. Gloria Stuart, who played the role on the screen, was 4 years elder. In a nice twist of fate, Ms Stuart would actually reach the age she played in Titanic and die at the age of 100 in 2010. In contrast, Ms Tolnay died in 1998, the same year the film was released in Hungarian cinemas. Ms Tolnay's other famous dubbing roles include the Fairy in "Cinderella" (1958), Salome Otterbourne in "Death on the Nile" (1984) and Daisy Werthan in "Driving Miss Daisy" (1990). Ms Tolnay was born in 1914 and grew up in Mohora, a small village close to my home town. Around 1995, I had the honour to see her on stage in the play this picture was taken in. 2. At the time of construction (1933), the Lakihegy radio mast was the tallest steel lattice tower in the world as well as the tallest building in Europe. With a height of 314 m and a maximum width of 14.65 m, it is both higher and much slimmer than the Eiffel-tower in Paris. Contrary to the free-standing Eiffel-tower, however, it is a guyed mast, which makes this technical advantage relative. (A free-standing steel lattice tower with better height-width ratio than that of the Eiffel-tower is the Berliner Funkturm.) Due to its characteristic diamond-like shape, the Lakihegy radio mast was a symbol of the Hungarian Radio for decades. Since 1985, it has been an industrial monument but is still used for power-distribution purposes. 1. Between his first career as a film actor and his second career as a politician, Ronald Reagan worked as "brand ambassador" of GE, the American industry giant. A very interesting selection of his television appearances as host of the "General Electric Theater", a popular TV series broadcast between 1954 and 1962, can be watched here.